Simonetta Carr has established herself as one with something of a vocation to introduce children and teenagers to some of the heroes of the Church. She has so far penned delightful and informative children’s books on Athanasius, Augustine, John Calvin and John Owen (as part of the ‘Christian Biographies for Young Readers’ series published by Reformation Heritage Books and aimed at children from 7 to 10 years of age). 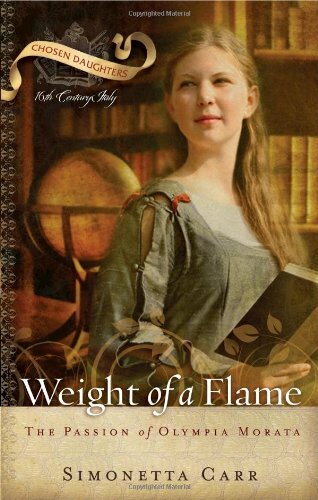 In her latest book, a fictionalised biography titled Weight of a Flame (P&R Publishing, 2011) she introduces ‘young readers’ (read teenagers) to the inspiring ‘Italian Heretic’ Olympia Morata (1526–1555), locating Morata in her social and religious context – a volatile sixteenth-century Europe – and highlighting her passion for Scripture, for Calvin’s Institutes, for scholarship (she lectured on Cicero, wrote commentaries on Homer, and was one of the most sophisticated Latin stylists of her time), for poetry, and for faith. Those seeking Morata for grown-ups should read Morata’s work first hand (published as The Complete Writings of an Italian Heretic and edited by Holt N. Parker) and the relevant chapter in Roland Bainton’s Women of the Reformation: In Germany and Italy. (There are also published studies by Jules Bonnet, Amelia Gillespie Smyth, Ottilie Wildermuth, Caroline Bowles Southey, Robert Turnbull.) But for Carr’s target audience, this book is the only one I know of on Morata. It’s just a pity that the book’s cover (by which all books are judged) is so suggestive of an advertising brochure for some exclusive and now-outdated ‘college for young, strong and self-reliant ladies’. Thank you, Jason, for this thoughtful review! If your readers want to know more about this book or ask any questions, they can check this page on my website: http://www.cbfyr.com/other-works/weight-of-a-flame/. There I explain what is fiction and what is truth in the book. I’ll check out the website Simonetta. Thanks. “It’s just a pity that the book’s cover (by which all books are judged) is so suggestive of an advertising brochure for some exclusive and now-outdated ‘college for young, strong and self-reliant ladies’.” Any discerning reader would look deeper than the cover, that’s not how I choose the books I read. I make decisions based on reviews, my knowledge of the author, and recommendations from friends/colleagues. It’s subject matter would probably also be in my sphere of interest. I’ll second your remark about the cover. Looks like the cover of a book you’d find in the Christian Romance section of Mardel. Just sayin’. Anyway, thanks for bringing Simonetta to my attention. Thank you for your comments regarding the artwork. I had little to do with it, but I will let my publisher know your thoughts, which will be helpful in future projects. I hope you’ll enjoy the book regardless. What a wonderful review. It’s just a pity that the reviewer does not recognize the room that Olympia is pictured in. It is a library. As for being outdated, all Lord of the Rings films depict such libraries in their narratives, as well as many other films that show a fascination for ancient books, and knowledge including all the Harry Potter films.